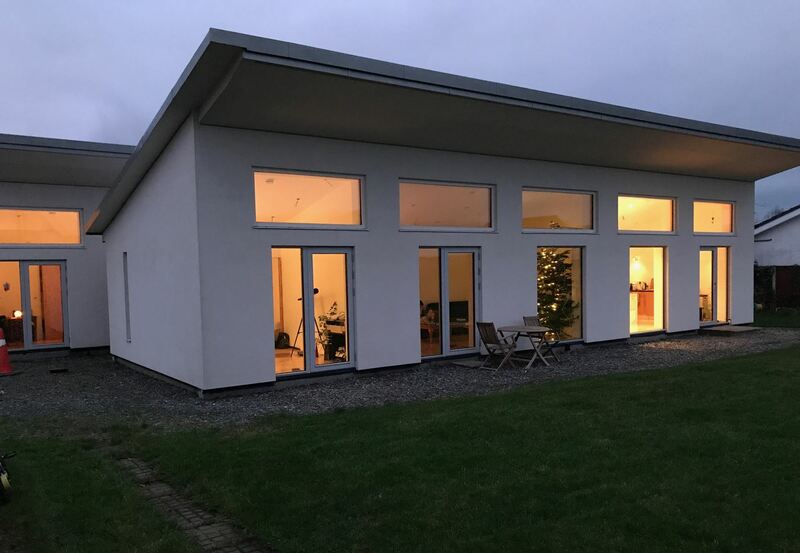 As part of the passive house requirement one needs to eliminate or minimise heat loss through linear lengths or points around the house. Some of the thermal bridges in my build are typical of other builds. I hope to provide more details in the future. One of the main linear heat losses is with window/door installations (its connection with the wall frame ). It has been said numerous times that selecting a high quality window/door and installing it poorly can equate to buying a low energy window . As mentioned before I will use the free software called Therm to calculate the losses. The first detail to tackle is the glazing which was directly mounted in the frame of the house without a window frame. These windows are 2.4 metres x .9 metre and there are 11 of these mounted on the south face. The calculation of these linear losses can be expensive to get done so I will be doing the task myself and have it checked by others. I am surprised that good details are hard to come by on the web for free to help the self builder. One of the most time consuming exercises with thermal bridge calculations is drawing the detail. If one undertakes drawing this oneself using CAD (Computer Aided Design) software it can help to reduce the cost of the calculation. When one needs to come up with a detail to minimise the losses there are a lot of products that help to keep the losses under control. These are semi-rigid insulation products like compacfoam, foamglass blocks, standard insulation, TECTEM, PU or rockwool and fibreglass products and aerogels (which is one of the highest performing insulators being made). To date there appears to be very few online resources to guide the self builder or provide details that one can use before one starts a build. Some background and details I found to date on thermal bridges can be found at the following links. Below is an example of the thermal bridge calculations one needs to carry out to establish the thermal bridge performance values in W/(mk). Tell Therm where on the drawing to stop the calculation (Adiabatic)-top and bottom of the drawing shown below. Go to a spreadsheet and calculate the psi values of the thermal bridge detail for the passive house performance value. When this is done one ends up with the calculation and an image like that shown below. In this image the glass is shown near the top right. In the next image the colours show the temperature gradients. The purple colour is the outside temperature at -10 degrees. There is thermal bridge software that one can buy where the software calculates the psi value without using a spreadsheet but Therm is free and there are courses available in Ireland. If one wants to show the real design and installation details of the thermal bridge values for the Irish regulations rather than the accredited details (without a performance value) one needs to use a certified thermal bridge accessors but this is not the case for the Passive House Institute. We can all look forward to the day when standard construction details that are typically used in Ireland are already calculated for the self builder and there will be no need to pay to find out the thermal bridge losses . The Scottish accredited details (see above link) come close to taking the guess work out of construction. How many times did we see on Grand Design or other home build programs the stories of things going wrong with the windows/doors. Now after going through the process hopefully the following may help other self builders. When the heat is captured or created in the house minimise the loss through the window (Called the Ug value for the glazing. )The Uw or U-value usually includes the whole window (including the frame ) but be aware that some window company’s may quote only the glazing value rather than the glazing and frame. 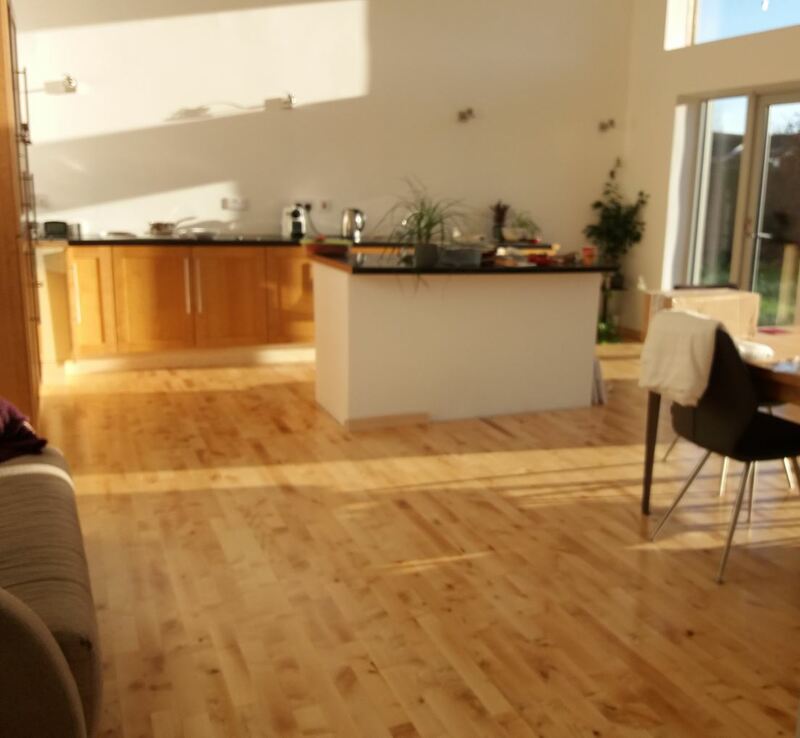 Maintain a sense of light in the room (the light level can be typically reduced by 30% (for triple glazed systems) when one tries to balance the above factors. 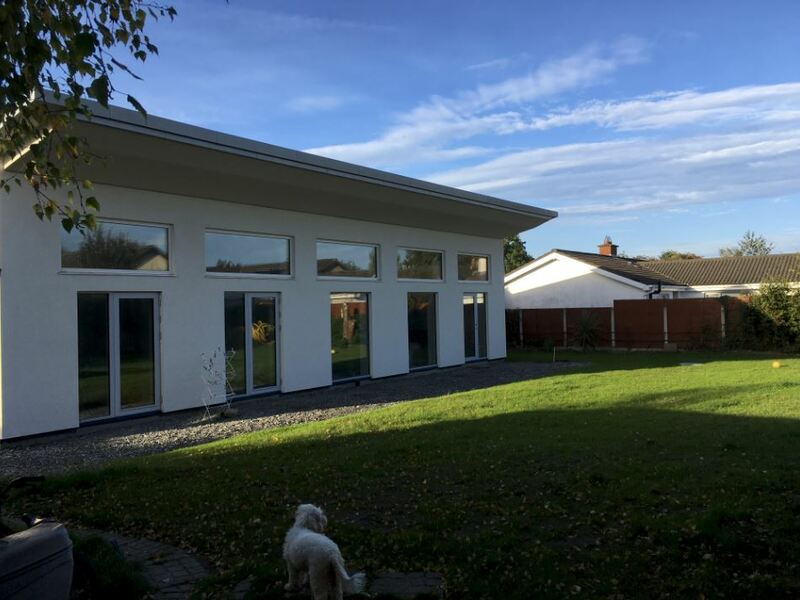 Ensure that west facing and south orientation windows are correctly shaded (or by means of special glass) in the summer/autumn so that the house will not overheat . The type of glass used in a self build can reduce the amount of insulation required in the house. One has to balance the g value ( g value represents the maximum amount of solar energy passing through the glass and 0.0 or 0% represents a window with no solar energy transmittance-if glass had a 53% = 0.53 g factor it would let 53% of the solar heat through. ) with the Ug value which represents the heat loss over a surface area in W (m2/k). The glass that works in Germany may not necessarily work in Ireland. One needs to balance these two values to suit your house and orientation in the PHPP software. 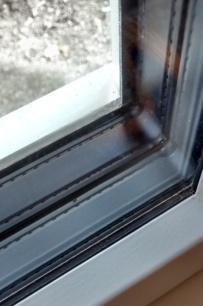 Another important factor is the glazing spacer used between the panes of glass. Most high quality windows will use a thermally broken spacer to ensure that the minimum amount of heat is lost through the glass spacer. One can see this by viewing the colour of the spacer -if is it silver/metallic then it more than likely has a high heat loss. If it is black it more than likely is a highly insulated spacer. Options are available in general to have the windows opening out or opening in (with or without tilt and turn). Tilt and turn mean that blinds and curtains need to be taken into account. I believe there are only two or three manufacturers of sliding doors that are airtight. Other options are folding units. Review the type of hinges (galvanized, steel, brass etc) and the handles specified (shapes). Some opening out windows/doors have the option of a locking system to ensure that a breeze will not affect the ventilation or damage them when left open. Establish which doors need external key locks for entry . There is an option to have wooden or PVC windows clad with aluminium (evaluate which is more suitable in your environment such as being beside the sea versus fully sheltered). Ensure the Ral colour touch up paint kit is available for small scratches and knocks that happen on site. Establish if you want alarm contacts pre-installed. A window with minimum openings (more energy efficient) will be significantly cheaper than a window with multiple openings (less energy efficient). A window that stays within the manufactures standard sizes and truck delivery size is going to be cheaper. A window that has a non standard shape is going to be more expensive. Sliding/Folding mechanisms and making them airtight is more expensive. Establish if one can use glazing without a frame in your design (roughly 50% cheaper). The frame that holds the glass and those used in passive houses will have an insulator such as cork or other insulation material separating the inside of the frame from the outside climate in order to reduce the heat loss. An equally important detail of a window is how it is going to be installed. 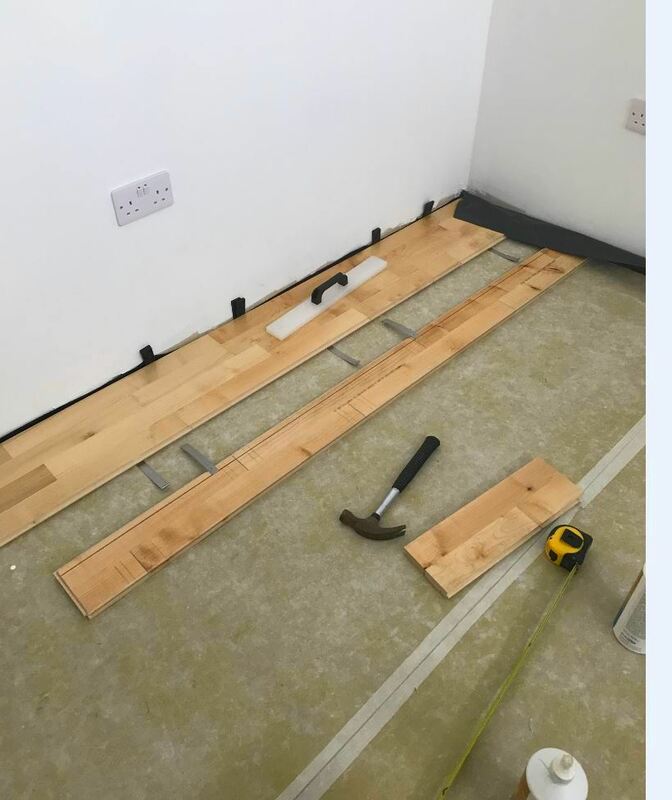 This can account for over a third of the heat loss if it is just placed in an opening and secured with a steel band/bracket and then foam filled around the edges. So in real terms money spent on a high performance window/door can be negated completely by installing it poorly. Below is a video I came across for guidance on installing windows in a timber frame build (Ireland) with a breathable insulation on the outside and a sketch of an externally insulated block work building later on in the video. There are a number of videos in this series. In my case I installed the windows in a wooden frame on a ventilated facade. As wood is a fairly good insulator (thermal conductivity of approximately 0.13w/(mk) ) I took the extra step of providing a better insulator around the reveal in order to improve the installation method and reduce the heat loss on the frame as the external cladding is vented with cement board. I am in the process of doing up the thermal bridge calculation using the free software Therm to calculate the actual linear heat loss (Thermal Bridge psi value denoted by the symbol Ψ). The other type of heat loss is known as the U value and is a measure of surface area in watts per m2 per degree change (W/m2/K). Where the window or doors were installed on concrete I installed Compacfoam (rigid insulation) under the window/door and I will insulate and provide an airtight seal up to this material. 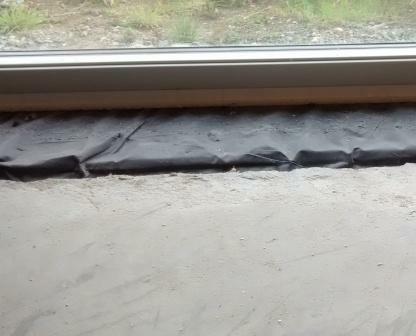 Window Frame Mounted on Compacfoam (insulator) in order to minimise the heat loss against the concrete floor. I installed some glazing in the structure of the building without the frames in order to reduce costs. The timber frame manufacturer, Matthew O Malley Timber Limited, rebated the openings and I then taped and sealed the glazing. There were 12 glazing units of 2.4 metres by 0.9 metres approximately. I installed security tape in the rebate. I experimented with other security tape but found the following tape to be better-Closed cell polyolefin foam tape which conform to BS 7950 Manual Glazing Test from tapes direct in the UK. 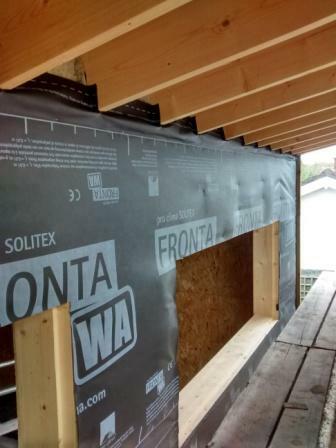 Glazing openings with rebate in timber. As the structure of our home is made with gluelam this helps to minimise the movement in a timber frame build to facilate installing glazing without a frame. I am not sure if glazing can be installed directly in a standard timber frame build. air-tightness (the normal passive certified window will have two or three seals mounted in the frame) .